THE GABRIEL! THE GABRIEL! We�ve just learned that KNOM has won the �Radio Station of the Year� Gabriel Award for the fourth straight year! See article below! KNOM-AM tower, which is located on the tundra 3 miles east of Nome. 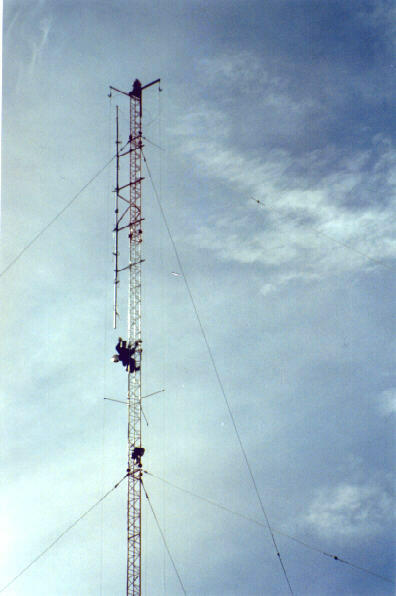 In addition to painting the 236-foot antenna, Rod also changed its beacon lamps, inspected its hardware and adjusted all of the guy wires to ensure the tower is plumb and straight. At the age of 29, the KNOM antenna is one of Alaska�s oldest guyed towers, and needs a checkup at least once a year. It requires a fresh coat of paint about every seven years. Rod wears absorbent fleece mitts, which he dips into the paint and then rubs onto the steel surfaces. It�s tedious work which takes about two minutes per foot of tower. INSPIRATIONAL SPOT: However quietly we speak, He is so near that He will hear us. We need no wings to go in search of Him but have only to find a place where we can be alone and look upon Him present within us. top YOUR PRAYERS ARE REQUESTED for Alaska missionary priest Fr. Tom Carlin, SJ, who died of cancer July 25th, at the age of 63. 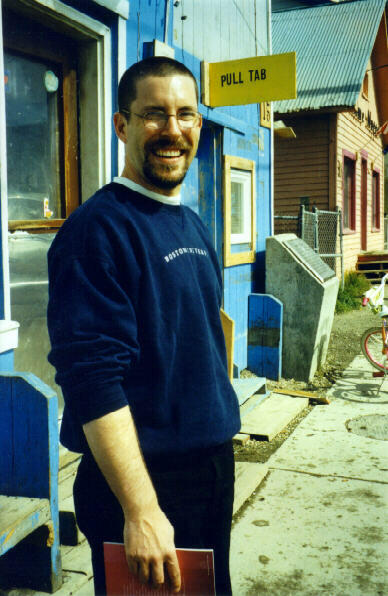 At various times, Father Tom served as pastor of the parishes of Kotzebue, Nome, and rugged Little Diomede Island, and at the time of his death was visiting priest for the small outposts of Unalakleet, Stebbins and St. Michael, in the heart of KNOM listening country. WHAT A DISH! That�s what general manager Tom Busch and engineer Les Brown were saying about a tiny four-foot satellite antenna that the Associated Press installed on top of our garage roof to pick up the AP teletype and radio network. Over the past year, AP has been switching their member stations onto a new satellite that is not favorable for western Alaska. In fact, its �look angle� (height above the horizon here) is less than three degrees, and the experts predicted that it would probably not work. Installed as a temporary test July 27th, the little dish is providing a minimal signal, but it�s working better than anyone expected, well enough that in the next month, AP will provide us with a much larger, more sensitive antenna. Please join us in a hearty welcome for volunteer Mike Nurse, who arrived July 6th. Originally from Palo Alto, CA, Mike has spent the past three years in Boston, where he was a food service manager for Marriott. How would you describe KNOM to someone who�s never been here? Mike works an afternoon announcing shift, and he�s organizing a new generation of Eskimo stories and legends programs. In his spare time, Mike enjoys the martial arts?Tai Chi, and Kaenpu Karate, in which he has a blue belt, halfway to black. May the Presence of the Father, the Son and the Holy Spirit fill your heart with joy -- and with perpetual surprises. top RADIO STATION OF THE YEAR! KNOM wins the �Radio Station of the Year� Gabriel Award! Are you as excited as we are? For the fourth year in a row, KNOM has won the highest honor in broadcasting! The KNOM staff let out collective whoops of joy when we heard the good news. Please give yourself a pat on the back for being a part of the KNOM family, for you are truly the backbone of our mission. General Manager Tom Busch will accept the award on your behalf on October 16th in Las Vegas. Can you attend? Las Vegas is a long distance from where most of our benefactors live, but we�d love to have a KNOM �cheering section.� If you can be there, please contact Tom before September 10th, when tickets have to be ordered. Incidentally, the highest Gabriel television award is being presented to Boston station WCVB-TV. �Touched by an Angel� star Della Reese is receiving the Personal Achievement Award. Lesser honors, such as �Best Public Service Announcement,� go to KNX Los Angeles, WGBH-TV Boston, WDIV-TV Detroit, NBC-TV�s �Dateline� program, Canadian Broadcasting Corporation, National Public Radio and WPIX-TV New York, among others. INSPIRATIONAL SPOT: God has created me to do Him some definite service. He has committed some work to me which He has not committed to another. I have my mission. I may never know it in this life, but I shall be told in the next. Therefore, I will trust Him. If I am in sickness, my sickness will serve Him. If I am in sorrow, my sorrow may serve Him. He does nothing in vain. Only God knows the ultimate plan. top VERY SPECIAL THANKS to an anonymous donor who contributed $10,000 to get our mission �back in the black� after we extended our antenna booster program. Thanks to this donor, and many others, we were able to distribute a total of 736 antenna boosters into fish camps and distant villages, at a cost of $42 each. In July, the station received noticeably more telephone calls and mail from faraway points, indicating a stronger listenership than ever. Thank you to our anonymous friend, and thank you to everyone! As winter approaches, we are still short $12,471 for our replacement emergency generator, a project that will cost a total of $22,450. This is to replace the small generator which our mission has outgrown, to keep us on the air when power fails. At very little cost, we have enlarged the generator room in our garage, and are ready for the new power plant when the funds are available. THIRTY YEARS AGO: KNOM founder Fr. Jim Poole, SJ had just passed one hurdle, when the FCC waived the �freeze� they had imposed on new applications, and agreed to examine his proposal for a new station. Now, he faced the Department of Interior, which had halted all grants of federal land pending resolution of the rights of Native Alaskans. It would take another year to get the Interior to budge. Ironically, in the face of these two �freezes� (which was the official government term), August 1969�s weather was unusually cold and grim. GETTING INTO A SCRAPE: KNOM engineer Les Brown takes advantage of a two-day dry spell in July to scrape peeling paint and re-prime the base of the satellite dish at the remote transmitter site. Les repaints the steel pilings and H-beams every two years. Although we designed all of KNOM�s facilities to be as free of maintenance as possible, there�s still plenty of work to get things patched up and ready for winter..
SOMETHING FISHY? Several friends have read about an abundance of Alaskan salmon, and have asked about our reports of the disasterously poor fishing that the people of our region are suffering this year. Alaska, of course, is an immense state. 500 miles south of Nome, there was a remarkable surplus of red salmon in the Bristol Bay region. This is largely a commercial fishery, with many of the fish caught by big Lower 48 boats. On the Kenai (KEEN-eye) Peninsula south of Anchorage, sport fishing is excellent for trophy king salmon. However, throughout KNOM�s vast listening area, things are far different. The salmon runs have been so weak throughout the Kuskokwim (KUSS-ko-kwim) and Yukon Rivers and the Nome and Kotzebue (KAHT-zeh-byoo) regions that officials have completely closed most fishing. Here, villagers typically fish from small 20-foot outboard skiffs. The few thousand dollars they traditionally earn from fish comprises at least half of their family�s annual cash income, and an additional few hundred fish would form the basis for their family�s food. And so, while the news down south is good, it is extremely dismal for people here. 19,800: That�s how many inspirational spots KNOM has broadcast during 1999, and we�ve aired an equal number of educational ones, as we beam the word of God�s Love 24 hours a day. By the time you read this, Nome will probably have gone through its first freeze of the autumn. Wild berries should be there for the picking, an important source of vitamins for Alaska�s rural inhabitants. As we approach the early Alaskan winter, thank you once more for making our work possible. God bless you! INSPIRATIONAL SPOT: Mercy is at the very core of our being. We can be merciful because we are like our Heavenly Father, Who is the source of mercy. But sometimes, pride, hurt and anger can get in mercy�s way. When we offer mercy to another, regardless of whether it�s deserved, we also offer hope and reconciliation. Just as Jesus does for us.